-- 1 oz. 6 oz. 1 oz. and 6 oz. 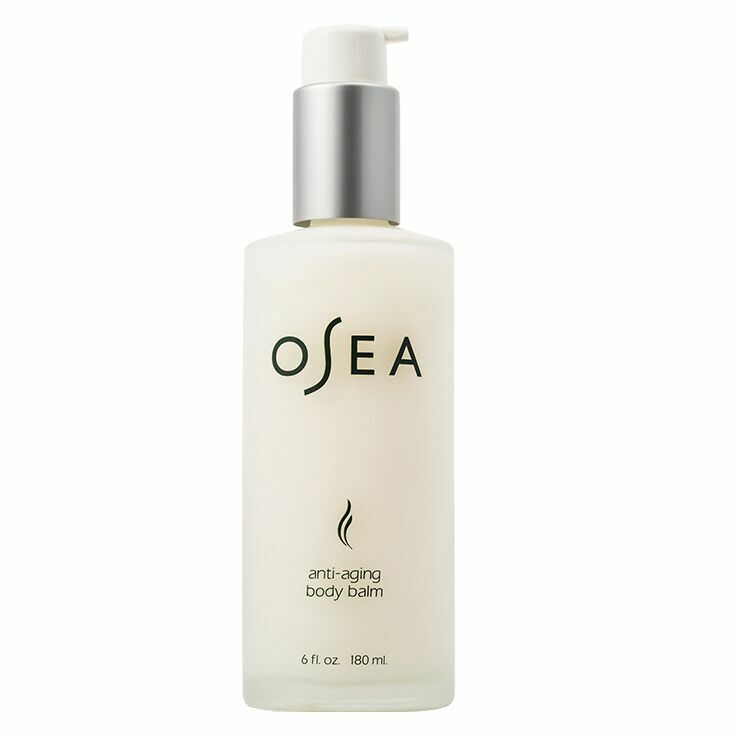 OSEA Anti-Aging Body Balm to the rescue for dry, rough, lack luster skin. This rich body moisturizer contains acai, babassu, and passion fruit oils to provide an intense feeling of non-greasy hydration that makes skin look firmer and revitalized, as well as Patagonia seaweed to address issues of super dry skin. Coconut oil is added to combat signs of roughness and wrinkles, while geranium oil lends a calming feel and keeps skin looking clear. This balm is a delight to the senses with a soft aroma of lavender and jasmine. Shake product well before use and apply several pumps to dry or damp skin. Gently massage onto skin for a feeling of smooth, soft hydration. Use throughout each day as needed and be sure to apply generously before bed for a feeling of intense moisture and healing. Cocos Nucifera (Coconut) Oil*, Carthamus Tinctorius (Safflower) Seed Oil*, Octyldodecanol, Glyceryl Stearate, Alaria Esculenta (Algae) Extract, Gigartina Skottsbergii Extract*, Undaria Pinnatifida Extract*, Citrus Medica Limonum (Lemon) Peel Oil*, Citrus Paradisi (Grapefruit) Peel Oil, Ocimum Basilicum (Basil) Oil*, *Pelargonium Graveolens (Geranium) Flower Oil, Lavandula Angustifolia (Lavender) Oil*, Jasminum Officinale (Jasmine) Oil*, Passiflora Edulis (Passion Fruit) Seed Oil*, Oryza Sativa (Rice Bran) Oil*, *Euterpe Oleracea (Acai) Pulp Oil, Orbignya Oleifera (Babassu) Seed Oil*, Helianthus Annuus (Sunflower) Seed Oil*, Caprylic/Capric Triglyceride, Aqua, Tocopherol, Rosmarinus Officinalis (Rosemary) Leaf Extract*. But pricey, so I took a star off for that. But it smells divine and doesn't leave your skin greasy and is beautiful to use at night before you go to bed.